That cycle would be due to bottom around the first of the year, and should drive the stock market generally higher until early January at which time we should get a more significant correction, probably as nervousness builds before the next earnings season. I've diagrammed the general directions and rough targets for what I think will unfold over the next month and a half in the chart below. However, the dollar shouldn't put in the true yearly cycle low until sometime in mid February to early March so there should be another leg down after the one bottoming in January. The final leg down on the dollar index into its yearly cycle low should drive the stock market back to at least marginal new highs later this spring. 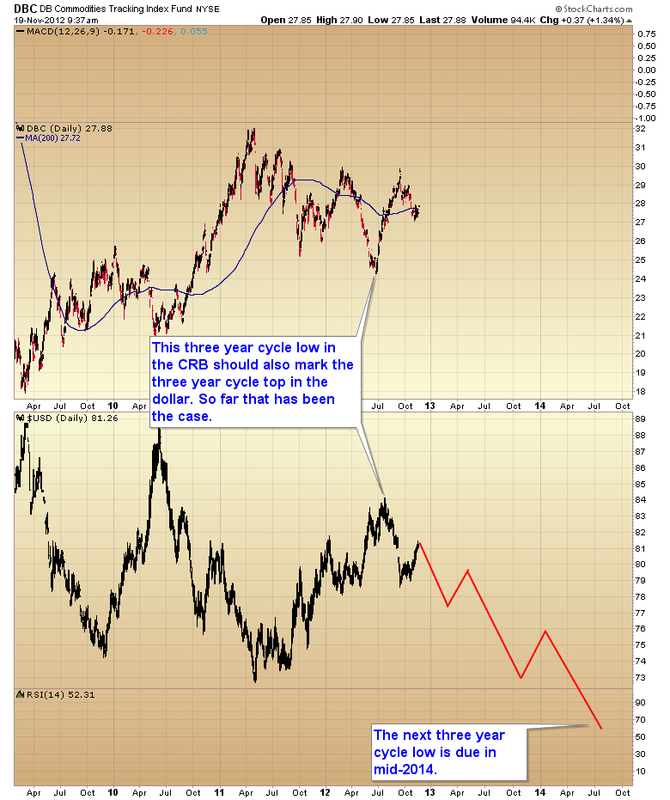 Back in June when the CRB made its final three year cycle low I said at the time that this should correspond with the three year cycle top in the dollar, which so far has been the case. We should continue to see the dollar generally heading lower with intermittent bear market rallies until it puts in a final three year cycle low in mid-2014. This should keep the stock market generally moving higher at least until the point where commodity inflation, especially energy, gets to the point it collapses consumer spending. 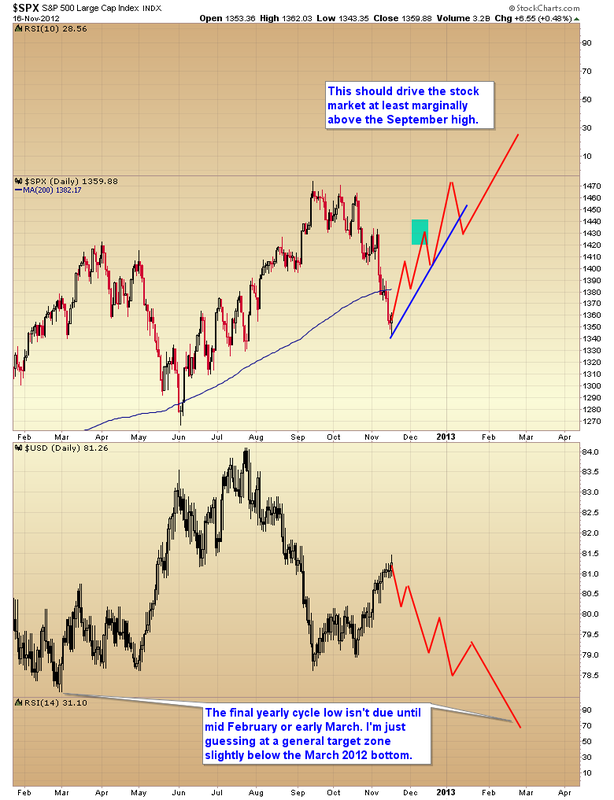 Once that occurs the stock market will start to stagnate and refuse to rise even if the dollar continues to fall. If Bernanke didn't learn his lesson in 2008 he will continue to print and spike inflation even higher creating the conditions for the next recession. 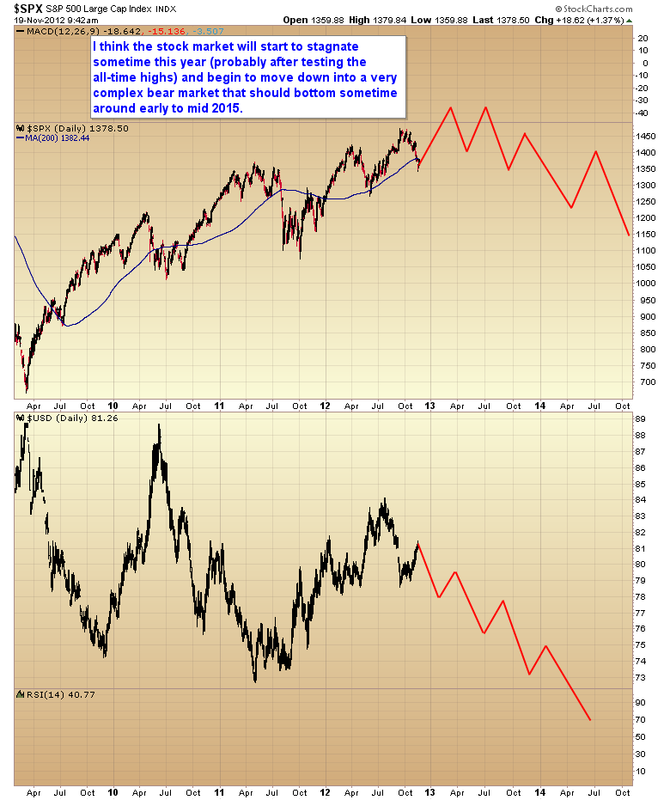 As has been the case in the 70s and also during the last cyclical bull market in 2007, I think we will probably see the stock market at least test the all-time highs, if not a marginal break above them, before rolling over into what I expect will be a very complex bear market bottoming sometime in 2015. Today should be the opportunity to get on board what is likely to be a significant rally over the next 3 weeks and probably a move to new highs over the next 2-3 months. 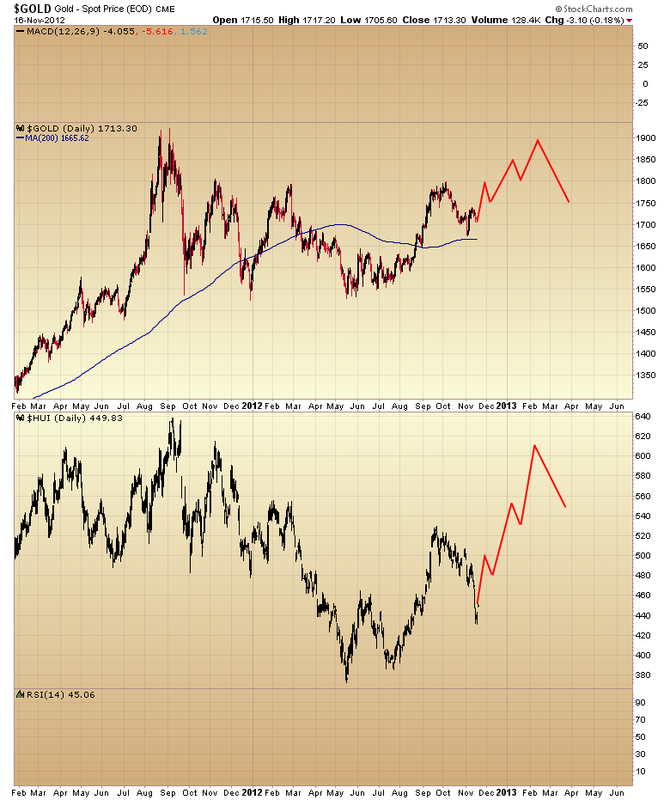 However I think the really big money will be made in mining stocks as gold should rally enough to make it's first test of the all time highs at $1900. It's not unreasonable to think miners will follow and test 640 during this time. The SMT premium newsletter is a daily and weekend market report covering the stock market, commodities, and the precious metals markets. GoldScents is a financial blog focused on the analysis of the stock market and the secular gold bull market. 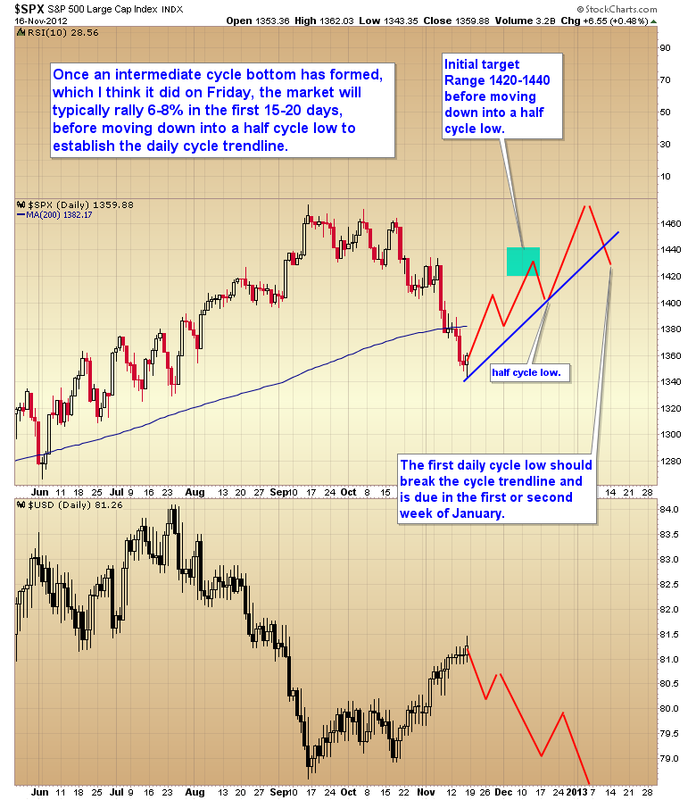 Subscriptions to the premium service includes a daily and weekend market update emailed to subscribers. If you would like to be added to the email list that receives notice of new posts to GoldScents, or have questions,email Toby.